Premium 1st quality 100% cotton fabric. Designer Moda Precut Fabric Jelly Roll. Includes duplicates. Baby Lock Unity, Spirit, Ellismo Gold, Ellegante 6223EM. Serger Machine Rolling Totes. The large Machine On Wheels with extra wide top opening is easier to load. 100% cotton. Baby Lock Unity, Spirit, Ellismo Gold, Ellegante 6223EM. Bernina Bernina 8 Series, 780 & 750 6226EM(snug fit). With the right quilt supplies, anyone can create beautiful quilts, table runners and other projects, no matter their skill level. By Chloe's Closet for Moda Fabrics. Designer: Chloe's Closet. Product type: Jelly Roll. The first photo is the jelly roll. Jaipur Textile Hub. we assure you that we will resolve any kind of issue or concern you may leave. 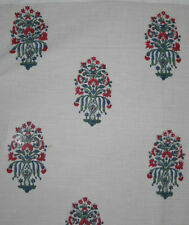 This HAND BLOCK PRINTED FABRIC is handcrafted by village artists in. ITEM CORD:- SRD00. FABRIC:-LIGHT WEIGHT COTTON. QTY:- 10 YARD. Unit of Sale Roll. MATERIAL:- COTTON. Pictures above are just few to show the variety, colors and designs made in this.